I had a teensy weensy mini-break towards the end of last week. A invited me up to her dad’s brand spankin new cabin in Lake Hauto. This place is phat, yo. And it’s even more impressive when you know that the cabin was put together in a day. Yes, a day. Thus is the beauty of modular construction. I got there on Thursday night and they treated me to a fine dinner of fried shrimp and powdered mashed potatoes, courtesy of the local Wal-Mart. I’m not embarrassed. And in light of the current economic situation, there ain’t nothing wrong with doing your food shopping at Wal-Mart. Especially this particular Wal-Mart. It’s hella cheap. Even for a Wal-Mart it’s cheap. They’re practically giving stuff away. 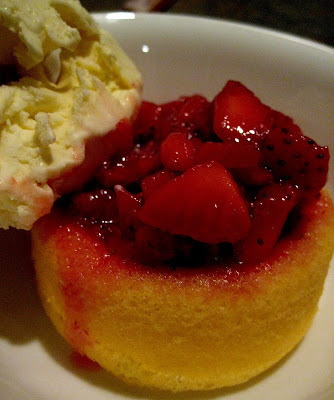 For dessert, we had some homemade strawberry shortcakes. There wasn’t any whipped cream, but there was a scoop of Heisler’s vanilla ice cream on top. More on Heisler’s to follow. The strawberry topping was courtesy of A’s mom. Word. On Friday, after being rowed around Lake Hauto (thanks J! 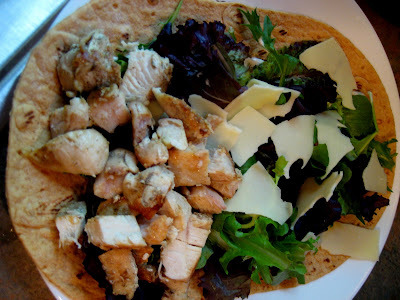 ), we had ranch chicken wraps for lunch. Yum. The wrapping wasn’t round, it was more rectangular, which made the whole thing even better. Thumbs up on the non-round wraps. Drizzle with ranch dressing, throw some spring mix in there with some swiss cheese and grilled chicken, wrap it up, and voila! 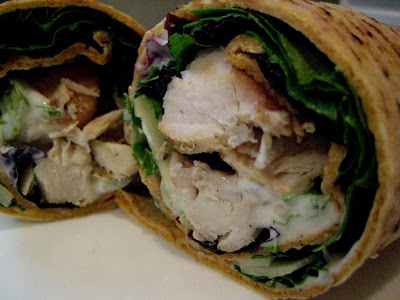 Behold, the yummy yummy wrap! They have a wet bar at this new swank cabin. 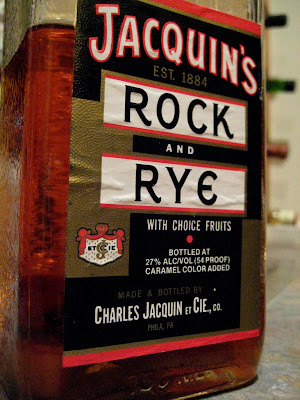 And we found this bottle of Jacquin’s Rock and Rye. What is it? No freakin clue. We did a little googlin and found out that rock and rye is rye whiskey with fruit and a bit of rock candy. It was slightly creepy. There were slices of petrified citrus something or other in the bottom of this bottle. But it was cool in a vintage way, and it came with a built in pourer! Noone was brave enough to taste. Hey! In my defense, I don’t normally do my food shopping at WalMart! If you’re at Lake Hauto and need to go food shopping, you don’t really have many options!